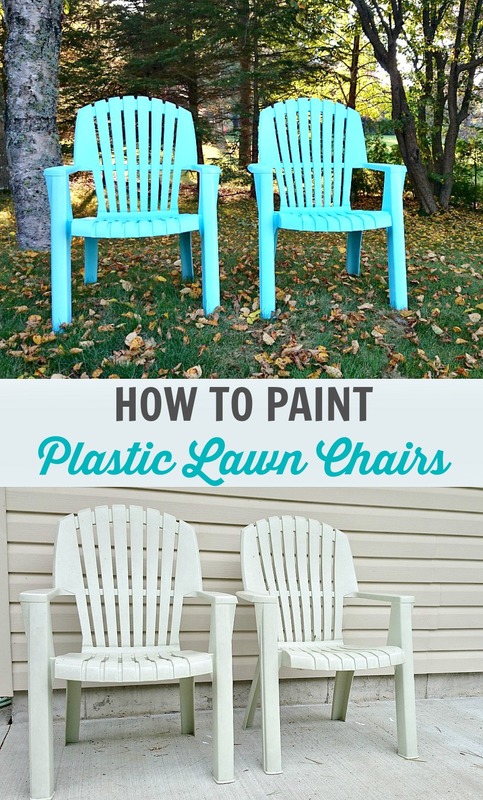 If you’ve ever wanted to know how to spray paint plastic lawn chairs, check out this before and after! 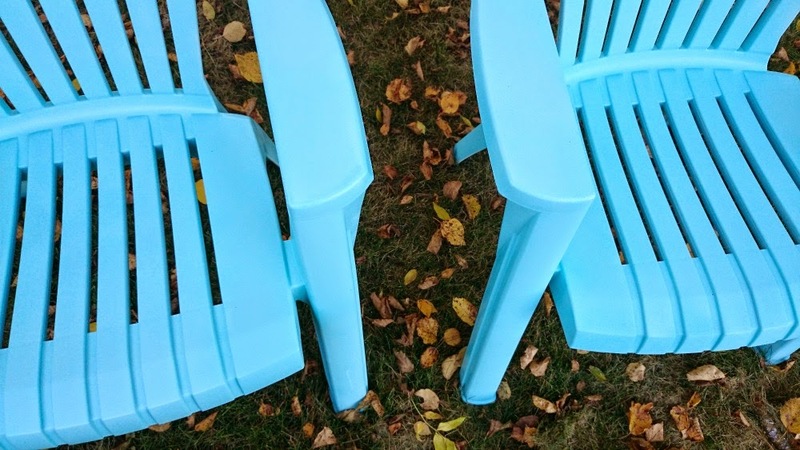 The previous homeowners left us a pair of plastic lawn chairs but I didn’t love the beige, so I decided to try spray painting plastic. 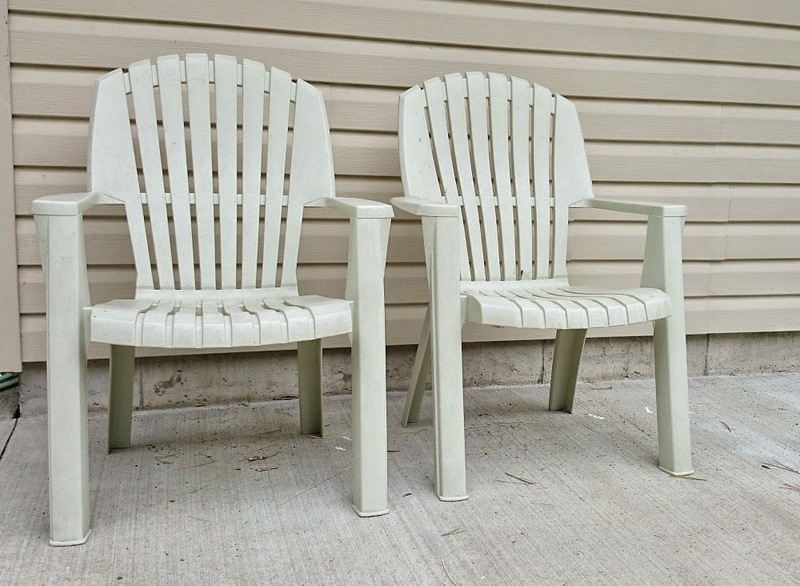 It turns out that it’s easy to spray paint plastic and painting my beige plastic lawn chairs immediately made them look crisp and new. 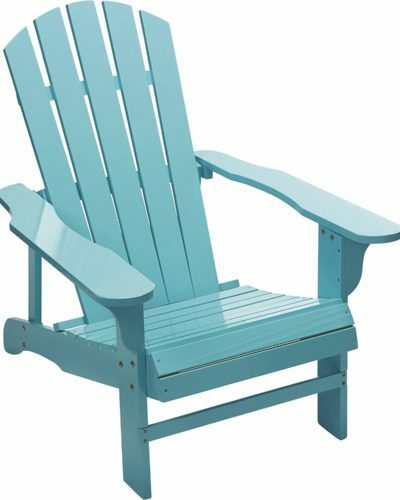 Here’s a peek at our “new” aqua lawn chairs! Painting plastic is nearly identical to painting other surfaces. 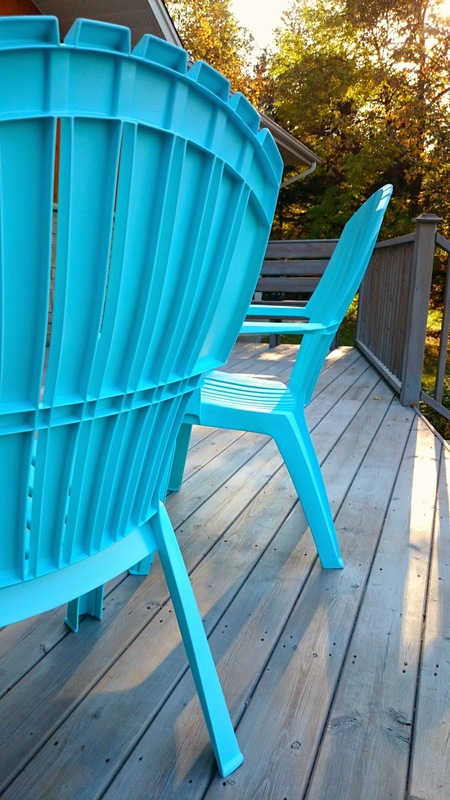 Although many Rust-Oleum paint products can be applied without a primer – or include a built-in primer – it was recommended that these chairs be primed first. I cheated and used a Rustoleum paint + primer combo in flat white as my first coat, because that’s what I had on hand. Other than that, the steps for painting plastic were simple! Scrub the chairs with Mr. Clean. I used Q-tips to really get into the corners (there was a lot of gunk on these). 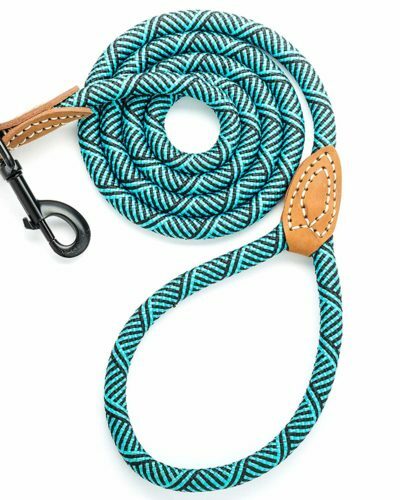 Rinse with a garden hose to thoroughly remove soap and let dry. Using multiple, thin coats apply the primer. With one hour (or after 24) apply multiple, thin coats of paint (I chose Painter’s Touch in Satin Aqua). I didn’t flip the chairs over to paint the undersides, because they will never be seen. Instead, I painted what could be seen underneath the seat with a few blasts of spray paint. 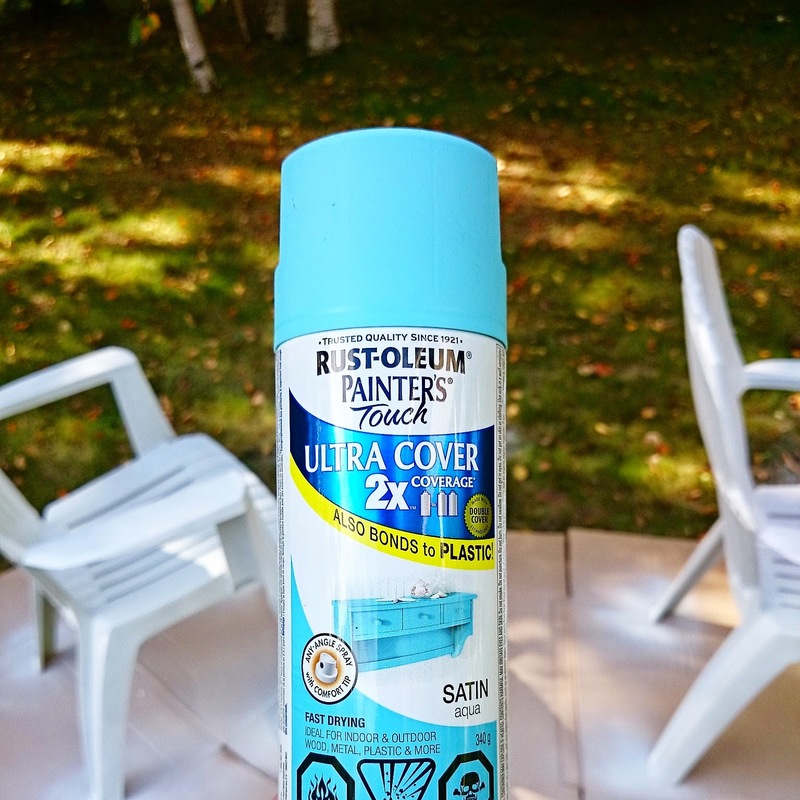 These new-fangled spray cans that can spray in any direction are excellent for speeding up a project because instead of flipping a piece of furniture back and forth (and wasting paint on the bottom), I just crouched down and sprayed upwards to cover what’s visible of the underneath area. So easy!! 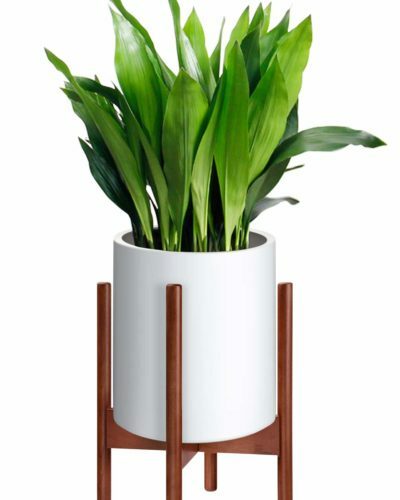 I did make sure, however, to spray the backs, under the arms and the insides of the legs thoroughly. It’s definitely an aerobic activity making sure that the surface is evenly covered from all angles. Although this paint dried quickly – it was dry to the touch in an hour – it takes a bit longer for paint to fully cure on plastic (about a week). So I made sure to store these so the paint could fully cure before subjecting them to wear. Unlike metals and woods, there’s always a chance that not all plastics will accept paint well, but these turned out perfectly. 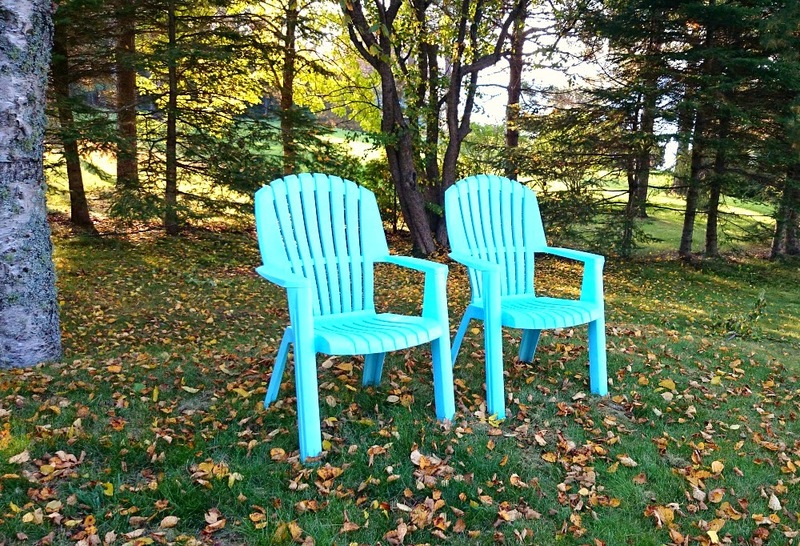 If you’ve ever wanted to know how to spray paint plastic lawn chairs, hopefully you feel emboldened because as long as you have the right product and prep – it’s so easy! 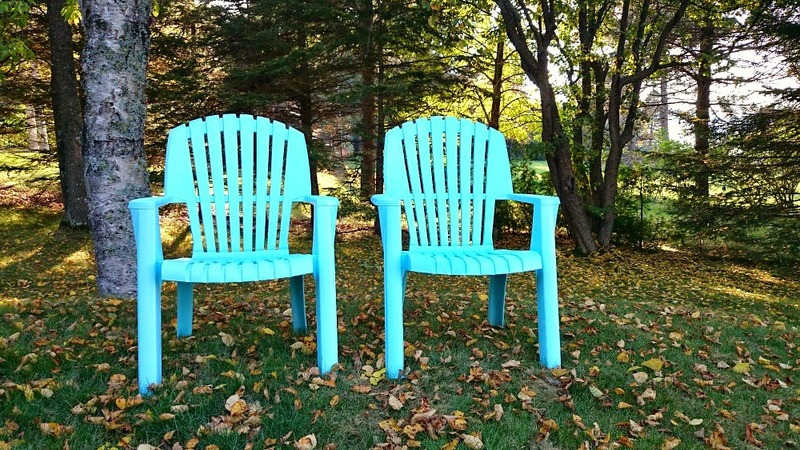 For these two chairs, it took one can of primer and three cans of paint. The only reason I required so much paint was all of the nooks and crannies at the back of my chair! Plus it was a kind of windy day. Every day on the lake is a windy day, so sometimes I don’t even notice. A simpler chair and calmer weather would require far less, I’m sure. Time-wise, it took less than an hour (including scrubbing, but not including dry time). The former owners left all kinds of goodies behind. 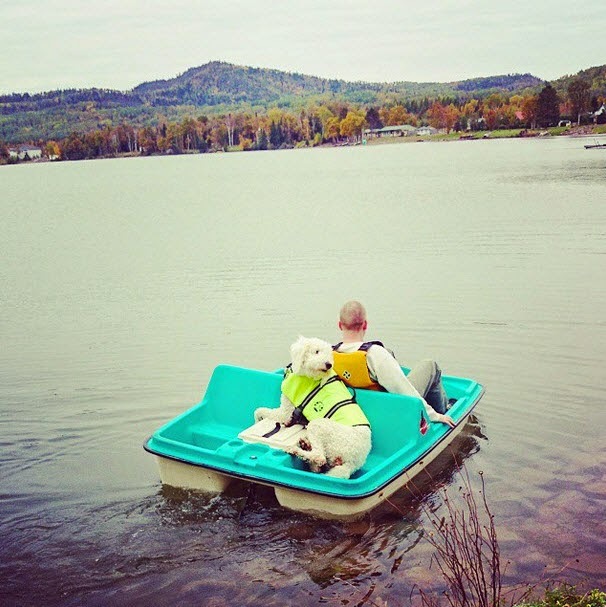 Did you catch Szuka and Handy Hubby in the paddle boat we unearthed last week? I shared an adorable photo on Instagram but I’ll admit something just to you: the whole boat ride Szuka was pretty calm as we paddled back and forth close to shore. She leaned against our backs, which was so cute. I hopped out and Hubby paddled away so I could snap a photo. She started to fuss and fuss and fuss and … SPLOOSH – found herself in the water. Seconds after she hit the water, she was already booking it to shore. The girl can paddle. I’m not even sure the top of her head got wet, thanks to her awesome doggy life jacket. Once she made it to shore, she looked at me like, “we’re both safe, but what about him? Who cares about him? Let’s escape while we can” and she took off toward the house, looking back to make sure I was behind her. 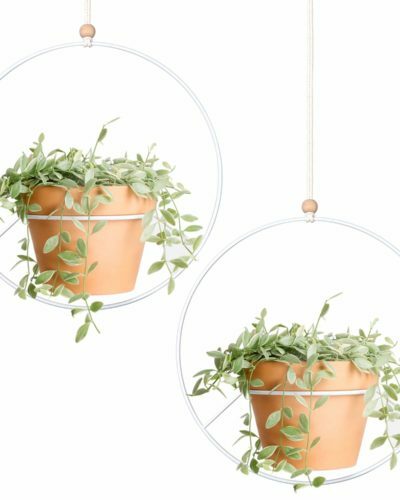 Looking for more easy spray paint furniture makeovers? Check these out: DIY dipped stool makeover, mcm tulip table makeover, vintage typewriter table makeover, and spray chalk paint cabinet makeover. Have you tried Krylon Fusion, the spray paint specifically for plastic? I haven't used it in a project yet, but I've been told it really does bond with the plastic. I haven't tried it! Didn't know about it. This stuff is formulated for plastic, wood, metal etc. I like the versatility because I always have extra. 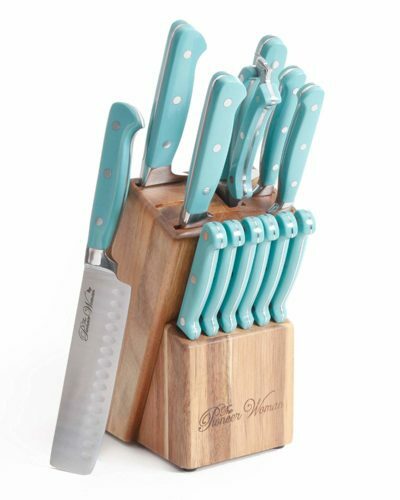 perfectly matches everything else in your home 🙂 I think szuka needs a matching collar, yes? Haha, I definitely looked for one!! 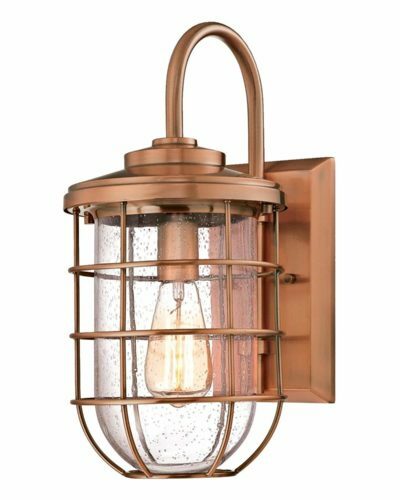 I have a gold project coming up that is really different for me! Not a drop of aqua, lol. 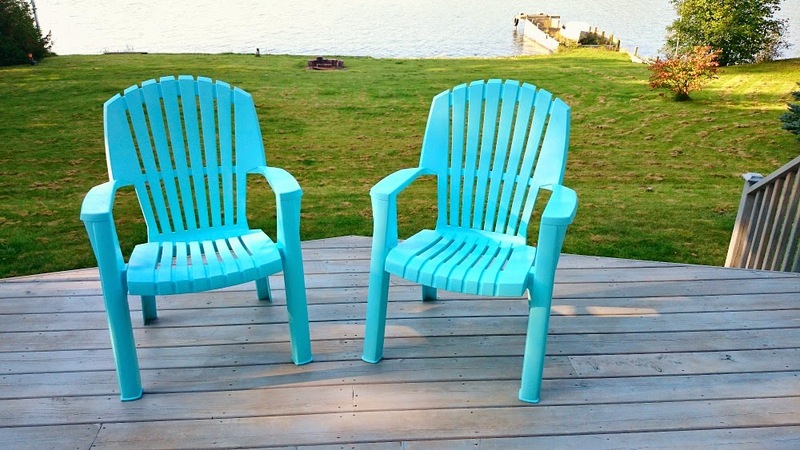 They look awesome I would never have thought to paint plastic chairs, I have a few of the beige boring ones lurking around at home too! Thanks! Spray paint has definitely become a lot fancier, with formulas to cover everything. I'm finding the coverage is getting better and better, too. I'm spray painting everything in sight right now, and getting really nice, even coverage. Wow, the coverage on those chairs is incredible! I feel like I'd be there all day trying to get that level of colour. Was that just one can? I used a can of paint + primer and three cans of aqua paint. I wouldn't have needed so much, except the nooks and crannies at the back of the chair took a lot of paint. I just kept layering on super thin coats. It looked crummy at first, but I tried my best to be patient and keep layering it on thinly. It only took about an hour of spraying to achieve this intensity. Putting on the layer of white seemed to help a lot, because the colour wasn't muddied by the beige. This formula (Painter's Touch) is designed for superior coverage and it seemed like it did, indeed, cover better! Her eyes went a little wide! We kept close to shore in then boat, though, so she had a short swim back. Her life jacket is fabulous. The chairs look great! Nice work! These turned out fabulous! 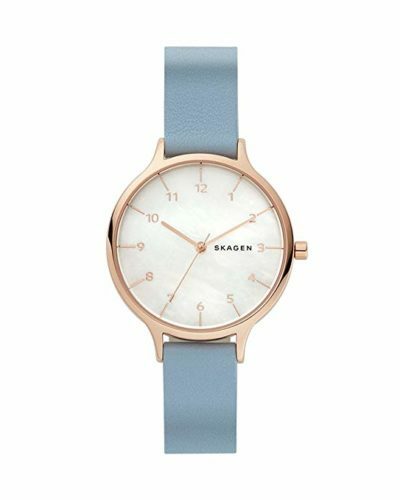 Love, love, love the color. Did they peel after a while ? They didn't but only one has survived the other was taken by the wind and smashed into a million pieces. That one did scratch but it was a strong enough gust to rip it apart. Other than that damage no peeling happened.